Reviewing products from twenty-eight different tea vendors has become a bit unweildly. Fortunately (for me) one of them, TranquiliTea in Plymouth, recently closed up shop when the owner decided to retire. In a couple other instances I’ve simply run out of tea from this or that company and can then simply decide to not buy anymore from (which my wallet will thank me for). Such is the case with today’s review. A few years back I bought this Adagio sampler pack and although there are a few I didn’t get to I have a feeling they’re no longer viable. Strangely enough, Adagio has decided to now reverse the name order of this product to “rooibos vanilla” without capital letters… Whatever. Vanilla Rooibos has a spicy Mayan chocolate-like aroma. In liquor a deep lime-tinged peach reminiscent of a Kenyan sunset. Vanilla Rooibos’s flavor however is highly comparable to any number of other rooibos tisanes: a herbal straw with hints of clove and vanilla. I might have hoped for a bit more of that spicy cocoa the aroma indicated. I’ll have to have drink some chai after this. Vanilla Rooibos’s texture has the characteristic prickly rooibos needle, though to a lesser extent than some. If you enjoy Rooibos, Vanilla Rooibos will be a nice addition to your collection. If not, you can skip it without missing much; not much to write home about. 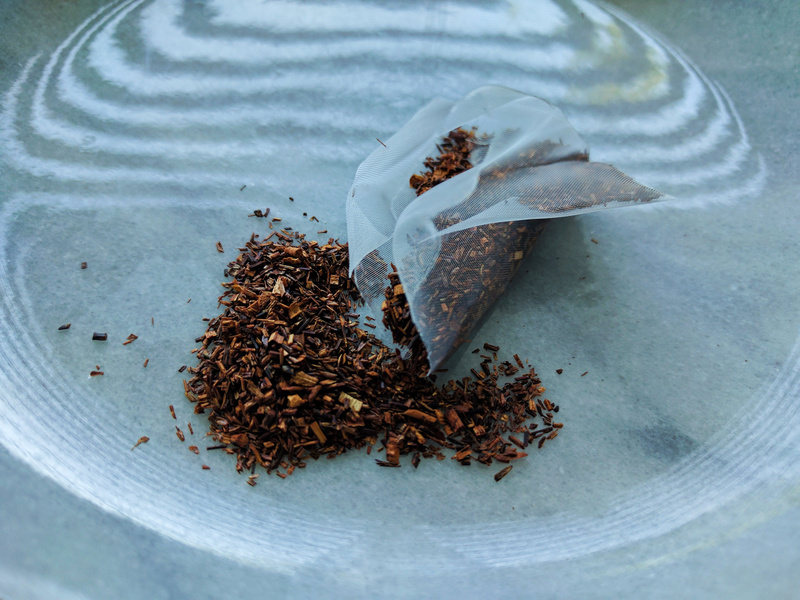 Vanilla Rooibos (Adagio) ~ CTC by Jocilyn Mors is licensed under a Creative Commons Attribution-NonCommercial-ShareAlike 4.0 International License. Vanilla Rooibos (Adagio) ~ CTC Macro 14x by Jocilyn Mors is licensed under a Creative Commons Attribution-NonCommercial-ShareAlike 4.0 International License. Vanilla Rooibos (Adagio) ~ liquor by Jocilyn Mors is licensed under a Creative Commons Attribution-NonCommercial-ShareAlike 4.0 International License.